Sure, six-pack abs are nice. But abdominal strength and endurance means much more than sporting Adonis-like abs. Developing your midsection has positive benefits when it comes to daily function, sports performance and physical health. Your abdominals act as an anchor for muscles of the mid and lower back. If your abs are weak, it forces the back muscles to work harder to support your middle. 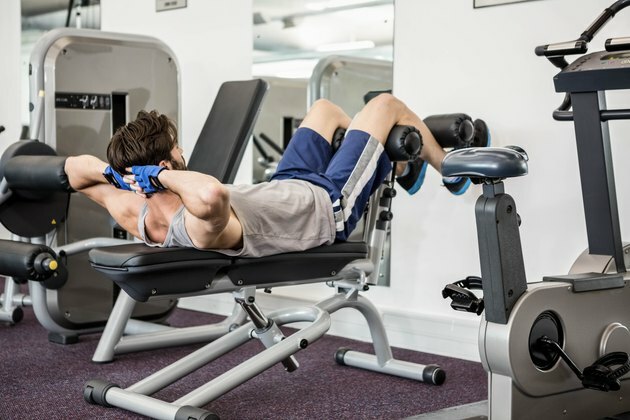 Abdominal strength improves the endurance of the muscles of your back so you fatigue less easily and are less vulnerable to strain or injury. Strong abs also keep your belly from protruding too far forward and altering your center of gravity. If your abs are weak — especially if you're overweight — this forward lean stresses your back. Strong abs help prevent an exaggerated anterior tilt to the pelvis. If you have this pelvic tilt, you may experience too much pressure on the lower back's discs and facet joints, flexible points that enable your back to bend. This pressure often leads to weakness, pain and potential rupture. Strong abs keep your vertebrae in alignment to prevent such deterioration. If you already suffer from back pain, abdominal exercises may help alleviate the ache by creating a more balanced body. Yoga and Pilates, for example, build abdominal strength and stability that supports a healthy back. Planks and anti-rotation moves, such as the Paloff press, are valuable as they strengthen the deep interior abdominal muscles responsible for trunk support. When your abdominal muscles are weak, you may naturally tend to slouch because you don't have the musculature to support proper alignment. Strong abdominals support good posture by helping prop up your spine so it feels more natural to stand tall with your arms and legs in alignment. Proper posture lessens wear and tear on your spine, which is a problem because it can lead to complications such as disc herniation. More benefits of better posture: You'll look taller, leaner and more confident, too. Simple actions, such as bending down to pick up a dropped object or tying your shoes, can be a chore if you have a weak middle. Twisting, lifting and even getting up and down out of a chair requires the strength of your core. Injuries often occur during these mundane activities when your back has to bear more than its fair share of the work to complete such tasks. Building abdominal strength and endurance also make household chores, such as mopping the floor and scrubbing the shower, easier, too, as you can bend, stand and crouch while moving your limbs with greater ease. All sports use the middle of your body for stabilization and action. You twist to catch a ball, gently rotate your torso when swimming, stabilize your center while running and bend when using a hockey stick or golf club. All of these moves emanate from strong abdominal muscles — you have control when you perform moves intrinsic to the outcome of the game or race. You'll resist injury, but if you do get hurt, a strong core supports recovery and healing. Abdominal strength and endurance also means you can potentially outperform and outlast your competition. Abdominal endurance is key to keeping pristine form for the duration of a marathon or through the second half of your soccer match. Your abs are the center from which your joints activate. When your abs successfully stabilize your trunk for long periods of time, you minimize wasteful movement from your arms, legs and hips. Perseverant abs keep you efficient and in peak condition through grueling events. Balance isn't just about standing on one leg and walking a tightrope. Balance comes into play every day — whether you're walking on an uneven surface, riding on a bumpy road or catching yourself when taking a misstep off a curb. Strong, resilient abdominals make such activities more pleasant, and potentially less disastrous. You can prevent falls or, if you do go down, be less likely to get seriously injured.